The research I have done is rather loosely related to gravity, if at all. About the best direct connection between gravity and my work is the fact that after all the light and magnetic fields are turned off, the atoms are so incredibly cold that they just fall like rocks due to the gravity. My actual reason for going into the field of Atomic, Molecular, and Optical (AMO) physics is largely because it seemed interesting. It is said that the quantum theory of light is the most well tested and most well understood theory ever! Even if the claim is not totally accurate, with that kind of statement it seems like there ought to be some way of connecting that vast wealth of knowledge to gravity. So with all the options facing me for career choice, this is what ultimately swayed me. Plus, the experiment looks really cool! Another reason I chose this line of research is for the challenge. I absolutely love an intellectual challenge, and trying to understand quantum mechanics has probably been the most challenging thing I have ever undertaken in my academic career! Anybody who says it is easy is probably kidding themselves or you. As a side note, the second most challenging thing I have encountered is trying to explain a technical topic to people who haven't learned the technical jargon. Scientists seem to have this uncanny need to be 100% precise in what they say, and at the same time want to explain all the details that personally fascinate them. I know I personally read through this section dozens of times just to make it right! Avoiding rambling and/or boring people definitely takes practice. So in a nutshell, that is why I ended up studying optics and quantum mechanics. Making useful connections between seemingly separate ideas is what really excites me both in my research and my desire to understand gravity. The love of a challenge is what keeps me going through it all. If you loved/hated this page, or have any comments, please send e-mail to comments@gravitysmith.com and I will personally respond. Please note that your privacy is very important to me. There is nothing I hate worse than spam and I will never use or release your information for any solicitation purposes. Also note: This page reflects only my personal views and does not represent the College of Optical Sciences at the University of Arizona nor any of its employees. 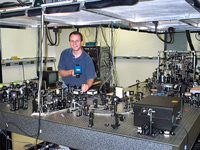 I have learned many things during my education at this institution and merely wish to share some of the excitement for the work I have done as part of the Laser-Cooling and Trapping Group. If something is not clear and you would like to learn more, please e-mail me.